Find hotel near The Crystal Castle And Sh .. Located in nearby Mullumbimby, a mere 20 minutes from Byron Bay, these lush private botanical gardens are the quintessential example of the wellness and holistic focus of the region. Irrespective of you religion, this beautiful Buddhist retreat is a must visit. The magical gardens with crystals, statues, and fountains all around make you feel like you’ve stepped into Southeast Asia. There are daily meditation sessions healing baths and sacred walks. The highlight of this place is the Kalachakra World Peace Stupa. The shop in the premises has books, stones, crystals, prayer flags and much more to offer. The restaurant is vegetarian only but offers simple delicious food. One can get a Tarot card reading or Aura photo and interpretation done here as well. There is a children’s playground and complimentary face panting for kids on the weekends and school holidays. All passes include a 132 pages Crystal Castle Guidebook (valued at $12 AUD, 1 per family/couple or single adult) and $5 AUD Discount gift voucher (in exchange for your email). 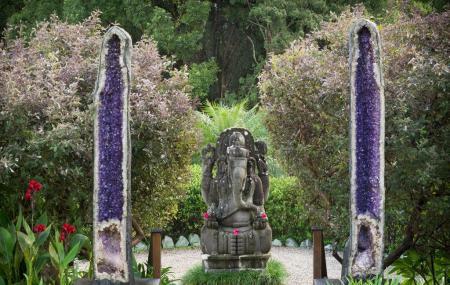 The Crystal Castle welcomes groups of 10 or more via advance booking. The restaurant is vegetarian only. Children may not find this place too interesting. How popular is The Crystal Castle And Shambhala Gardens? People normally club together King's Beach and Belongil Beach while planning their visit to The Crystal Castle And Shambhala Gardens.